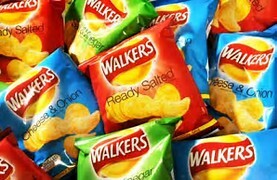 Have you purchased a packet of crisps lately, or 'chips' as my US readers call them? What about a packet of Doritos? If you have, then have you noticed anything different? Do the bags look the same size but the contents smaller in quantity? Well, you would be right to be suspicious, as we are all being conned by the snack producers, whether it is Walkers, Tyrells or Doritos. The crisp suppliers have decided to sell us bags of snacks containing up to 70 per cent air! Yes, AIR. 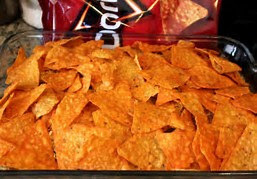 An investigation has revealed that while Doritos are the worst offender - with almost three-quarters of a 55g bag costing £1.09, made up of air. And the other producers of snacks are also at it! Experts say that the practice is to make customers believe they are getting more for their money, even though it is not illegal, as crisps are sold on weight rather than volume. If TV viewers saw the Channel 4 Super-shoppers TV programme last night, then they will know what I am writing about, as according to their researchers an average bag of Walkers Baked Crisps contained 59 per cent air. A packet of Tyrells vegetable crisps contained 55 per cent. Only one bag of those tested by the TV show was more than half full of crisps and that was a 200g bag of Doritos with 44 per cent air. Crisp producers claimed that bags are filled this way with with nitrogen, as oppose to oxygen, which makes crisps go soft, in order to cushion the snack from being crushed. However, I don't know about you, but I feel short-changed by this practice. I've been deceived by the absence of crisps in bags recently, such that two bags get devoured instead of just one! Not good for my weight! Our old friend, Pepsi, owns both Walkers and Doritos, so what have they got to say about this appalling practice of conning their customers? Press reports say they claim that their bags are filled by weight and not by volume and as these snacks are susceptible to a level of breakage, they fill the packs with air just prior to sealing so that this acts as a cushion in transit. I'm sure they do, but its noticeable that they don't comment on the increasing size of the bag that takes this air and the apparent demise of the contents. Thankfully, one retailer, Aldi, have launched an investigation with its suppliers. Irn-Bru - an ideal American drink. Let's Recycle Paper Cups Today!